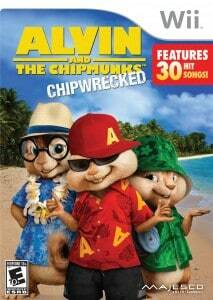 My children and I can’t stop dancing…..to the new Alvin and the Chipmunks™:Chipwrecked game available for the Wii™ and other gaming systems! Featuring 30 hit songs, including favorites like You Spin Me Round, Love Shack, La Bamba and Kids in America, this “Rhythm-Music” game is loads of high energy fun for the entire family. Alvin and the Chipmunks along with The Chipettes are singing and dancing and kids can choose their favorite character for the game play. There are over 50 different dance moves to learn in this game and you earn points for moving to the beat. My six year old son loves to show off his “Munk Power” by doing flashy, finishing moves to get extra high scores. My five year old daughter likes to customize her chipmunk character by selecting different clothes, hats, glasses and “bling”. Since Alvin and the Chipmunks™:Chipwrecked is rated E10 (Everyone 10+), it is a game that the entire family can enjoy playing together. My children are younger than the suggested 10 year olds and up but that has not stopped them from rocking, dancing and singing along with this game. We are big fans of Alvin and the Chipmunks™ and we love to sing and dance so this Wii™ game is the perfect addition to our game collection. It has been getting lots of requested game play with my children and there is always lots of giggling as we work up a sweat! To learn more about Alvin and the Chipmunks™: Chipwrecked game, you are invited to visit the official website…..check out the game launch trailer! You can purchase this game at Amazon.com and other leading retailers. It is available on Wii™, Kinect™ for Xbox 360® and Nintendo DS™.